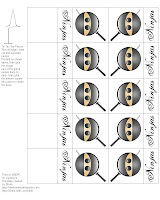 I was planning to do a pirates vs. ninja checkers set, but decided to start small with a tic tac toe set. The pieces are 1.75 inches, and the board is 7 inches. 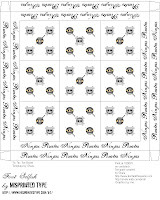 I'll do the checker board set I think, with smaller pieces. I like how this turned out. The art is my own, the font I used is Selfish by Misprinted Type. It's one of several great freeware fonts on the site, and there are some nice commercial fonts as well. To make it, print out all 3 pages on card stock. 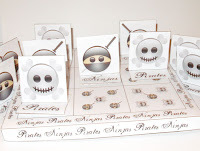 I always seal my printables with a quick spray of a clear coat. Score the folds then cut out. Glue the game pieces by folding to match the diagram on the sheet.If you print it out at 200 dpi in a graphics program, you'll make a smaller set which I think would be awfully cute as well.The board is just folded and glued like a very shallow box. Next post will be the blank templates to decorate how you'd like. Click on the images for the full sized versions. Argh! That is so, so cute! I love their little faces. I'll be linking.